Home » Twitter » So Who Else Caught the Brain Surgery on Twitter Today? So Who Else Caught the Brain Surgery on Twitter Today? If you were on twitter today, you may have seen the hashtag #MHbrain. That stood for Memorial Hermann-Texas Medical Center in Houston (@houstonhospital). Today they live-tweeted a brain surgery which removed a cavernous angioma tumor from a 21-year-old female patient. According to the hospital's press release, the goal of the "twittercast" was to (1) educate the public about brain tumors and (2) demystify brain surgery by giving a look inside an operating room. The surgeon, Dr. Dong Kim, added "Someone may have a loved one who is considering a similar procedure and perhaps they can glean some information from this twittercast that may help them make a decision about whether surgery is the right choice for them." In authentic social media style, the hospital did not just send out information and images. They also had another neurosurgeon, Dr. Scott Shepard, serve as an online moderator who could respond to questions and comments from twitter followers in real time. While there was much excitement over this event today, it is not the first time we have heard about surgeons tweeting from the operating room. Back in 2009, CNN picked up a story about surgeons at Henry Ford Hospital in Michigan tweeting the removal of a cancerous tumor from the kidney of a male patient. 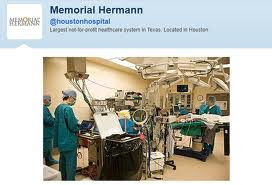 Just last February, Memorial Hermann was in the news for the first live tweeted open heart surgery. How is Memorial Hermann evaluating their twittercast efforts? Was this a huge marketing event or do they actually have health education goals? Are they simply looking at the numbers? For example, the number of twitter followers (up to 13,400 from 5,100 in the past 3 months). Or the number of visitors to Storify, a site which archives both the heart and brain surgeries. Are the demographics of twitter users reflective of their target audience? I would hope that they are thinking about how to evaluate the goals they explicitly laid out in their press release. How will they show that a twittercast can increase knowledge about brain tumors? How will they show that the public or potential patients have less anxiety about the procedure or choose it more often? As always, it is important to state goals (for any public health activity) that are measurable. How is social media a benefit/challenge for physicians? I read an interesting blog post recently called, "Why social media may not be worth it for doctors." The author was concerned about already burned-out doctors trying to learn and make time for ever-changing technology...with no guarantee that the technology will give them "return on investment". Do the challenges outweigh the benefits? If physicians view themselves as "educators", how much value could twitter bring? Are there patient safety or confidentiality issues that should be considered? Although the patient's name was protected and she gave permission for the twittercast, is it possible that any confidential information could be accidentally shared during the event? Although safeguards are in place, errors do happen in the operating room and throughout the hospital. With the additional staff/equipment (and possible distraction?) in the operating room to conduct the twittercast, could we face an increased risk of error? Related Posts : So Who Else Caught the Brain Surgery on Twitter Today?